It's that time of year for gaming in the name of a good cause. 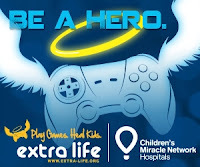 The Extra Life charity campaign takes place on October 20th, and is a great way to combine your hobby with some charitable donations! The idea is simple, you get people to sponsor you to play a gaming marathon on the day. There are lots of great folk taking part and even if you don't want to take part yourself, make sure you check out the program and support your fellow gamers in helping out this good cause.